Most college students would find the idea of presenting to a room full of Nike executives in turns unimaginable and daunting. For students in the Samford University Brock School of Business sports marketing program, it’s just part of the curriculum. In past years, the program has given students the opportunity to work with the Miami Dolphins, the National Basketball Association and German soccer team Bayern Munich. This year, their project culminated with an Oct. 27 presentation at Nike’s world headquarters in Eugene, Oregon. For senior Jay Michael Johnson, it was an unforgettable, if initially nerve-wracking, experience. “I think we were all a little intimidated, but that made it even sweeter to have eight of my best friends alongside me as we presented,” he said. That presentation was the final result of a research project stretching back to April 2017. Students spent months conducting a deep dive on football players in middle and high school, or as Nike refers to them, the Modern Warrior. According to White, the primary distinguishing factor between Gen Z and previous generations is that they’re digital natives. They were born into a highly digital and always connected world, making them fundamentally different from those generations that have had to learn how to navigate it over time, including millennials. That unique quality presents new challenges to marketers looking to understand their next generation of customers. So, in order to better understand them, Nike approached Samford’s sports marketing program for more information. At their behest, students collected data on the Modern Warrior from four primary sources: focus groups, surveys, big data from social media and secondary research. Their findings were then boiled down into five chapters, presented to Nike as The Book of the Modern Warrior, each highlighting a different aspect of who that customer is, how to communicate with them and the role brands play in their life. The audience included executives from across Nike’s Field Sports division, including new product development, marketing and social media, all of whom responded positively to the group’s findings. In fact, while just 15 minutes had been set aside for a question-and-answer session, the students fielded questions about their data for nearly an hour. “Their work confirmed several of our own suspicions, but also presented us with some unique insights through data driven validation that we will actively pursue as we develop our strategic plans going forward,” said Nike Field Sports Vice President Tracy Teague. The opportunity was equally valuable for senior Chase Tripi, who was responsible for researching the Modern Warrior’s social media usage. The experience has given him confidence in his ability to present large quantities of information in a way that offers real applications for marketers. 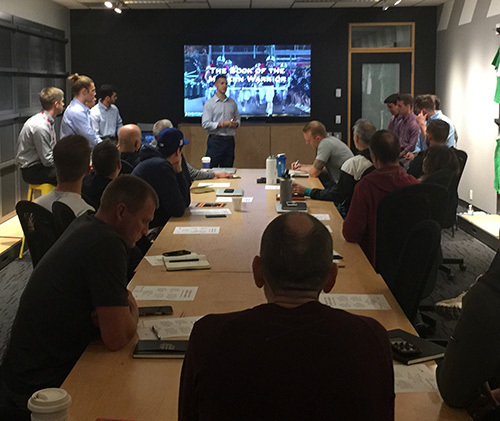 Even more important, completing a major consulting project for senior executives at a global sports brand like Nike gives these students the kind of real-world industry experience that is hard to come by elsewhere. And, it can ultimately be the defining factor that wins them a job after graduation. Drew Woolley is a freelance writer in Huntsville, Alabama, who reports for Samford University and the Center for Sports Analytics.